Your cultural itinerary includes sights like Queensland Museum & Sciencentre and Queensland Art Gallery. 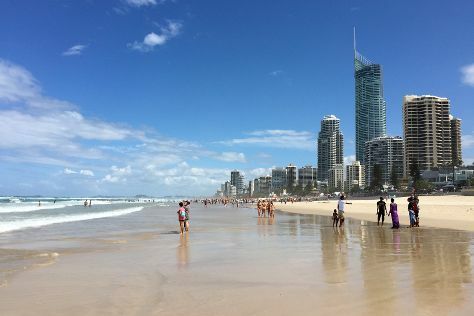 Your itinerary includes some good beach time at Surfers Paradise Beach and Burleigh Heads Beach. You'll find plenty of places to visit near Brisbane: Ripley's Believe It Or Not! Surfers Paradise (in Surfers Paradise), Tweed Regional Gallery & Margaret Olley Art Centre (in Murwillumbah) and Anthea Polson Art (in Main Beach). There's much more to do: explore the world behind art at Gallery of Modern Art, see the interesting displays at Museum of Brisbane, and contemplate in the serene atmosphere at Old St Stephen's Catholic Church (Pugin Chapel). To find maps, reviews, ratings, and other tourist information, go to the Brisbane visit planner. Sydney to Brisbane is an approximately 4-hour flight. You can also do a combination of flight and bus; or drive. In April, plan for daily highs up to 30°C, and evening lows to 19°C. Wrap up your sightseeing on the 24th (Wed) early enough to travel to Airlie Beach. Step out of the city life by going to Scuba & Snorkeling and Airlie Beach Lagoon. Above & Below Photography Gallery and Art Whitsunday Gallery & Shop are good opportunities to explore the local culture. On the 27th (Sat), spend a thrilling day on the water with a speed boat tour. Next up on the itinerary: take a tour by water with Boat Tours & Water Sports. To see reviews, where to stay, traveler tips, and more tourist information, you can read our Airlie Beach road trip app . Do a combination of flight and bus from Brisbane to Airlie Beach in 5 hours. Alternatively, you can do a combination of flight and ferry; or drive. Traveling from Brisbane in April, you can expect nighttime temperatures to be a bit warmer in Airlie Beach, with lows of 26°C. Finish your sightseeing early on the 27th (Sat) to allow enough time to travel back home.